The Public Access Lands mapping application is a map-based system that allows you to locate and obtain information on public access properties. Elk Creek Fishery Area, © Gary Scott. The Public Access Lands map viewer is powered by Geocortex Essentials v4.9 to provide robust map navigation, creation and search functionality. The map viewer has been adjusted for a cleaner display on desktop/laptop and tablet. Tools and data frames have been condensed to allow maximum map frame display. State Historical Society of Wisconsin Shipwrecks–displays the location of shipwrecks off Wisconsin coastline in shallow waters and provides a link to the SHSW shipwrecks web pages. Locations will be added to the dataset as documented by SHSW. DNR Hunting Closed and Restricted Areas–displays areas on DNR managed land which are closed or restricted for wildlife management. 2017 Leaf–On Aerial Photo–flown in the summer of 2017, this background layer displays imagery down to 1:990 scale. Non–DNR Fishing Easement–locations of public–accessible fishing easements in the southern half of Wisconsin. If you are creating a map to submit to the DNR for Archaeological/Cultural review, refer to guidance on map creation for the Arch/Historical report maps [PDF]. Home Data Frame -- Displays application updates and provides guidance to data layer usage. Includes data disclaimers and links for feedback and questions regarding the display and content of the application. Layers Data Frame -- Displays the map layers. Dropdown in the Layer List provides a selection of Map Themes, pre-set map layers for specific business needs. Option button allows user to toggle between Legend and Layer List. Change Layer Drawing Order is available to customize the layer display. Global Search Box — Allows the user to enter a name to search for map features. Layers that would return a high number of results, such as roads or water, do not have search functionality. Use the I Want to Find tool to search for these features. Layers that would return a high number of results, such as roads or water, do not have search functionality. Use the I Want to Find locator tool to search for these features. I want to… — Short cuts to popular tools such as Identify a Property, Print Map, Open Layer List or Bookmark Extent. This option also allows the user to Sign in to the application to Save and Open map projects. Note— different maps may have different short cuts. 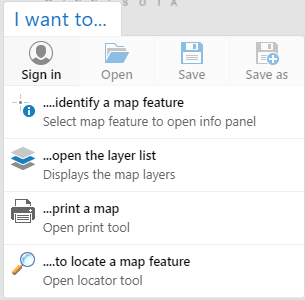 Map Themes Layers — Dropdown available in the Layer List to allow the user to select a map based on a specific theme. Default/Basemaps — Displays short-cuts to aerial photos, county tax parcels, Wiscland, wetlands, topo quads and Town/Range/Section. 2010-2013 aerial photos are organized as a "Slider" group which the user can drag to fade one aerial into another. Base maps vary between map applications. Coordinates — Selection will open the map coordinate display from cursor placement. User can define coordinate system as Lat/Long, Decimal Degree, Degree- Minutes-Seconds or Wisconsin Transverse Mercator (meters) and UTM in some applications. Scale Input – Selection will open the scale text. User can input specific scale for map viewing. Map Tools — Mapping functions organized by tabs to provide display options, map analysis and feature search capabilities within the mapping application. Unselect “Tool Labels” to hide tool labels for a slimmer toolbox. Use mouse-over tool-tips to identify tools. Why can't I see the property the state recently bought? The property has not been entered into our GIS spatial database. We attempt to enter them into the layer as fast as possible but quality digitization will take time. The web map server might be down temporarily. Please try again in a few minutes. If it still isn't available, contact us. Zoom to your area of interest. 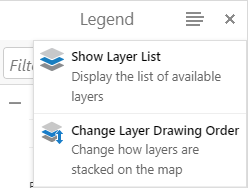 Click on the Layers tab in the Home data frame, scroll to bottom of layer list and expand (+) the Base Map Layers folder. Expand (+) the Aerial Photos folder and select the aerial photo that best meets your needs or select the USGS Topo Quads layer to display the topography. OR select the Default/Basemap icon in the bottom left corner of the map. The icon will expand to display additional icons. Select the Aerial Photos icon; a slider will display. Slide the bar between available aerial photos to compare the display of the different years and seasons. Select the USGS Topo Quad icon to change the background to topography. Select Default to return to the roads/rivers layer. No, private forest lands open to public recreation through Managed Forest Law and Forest Crop Law programs are not available on this map. See Private Forest Lands Open to Public Recreation Web mapping application. No, they are not available on this map. This web map contains those lands that for the most part are open to the public. For more information, see Platbooks and Land Ownership Maps or your county office. How do I add lat/long coordinates to the map as points? Map coordinates in spreadsheet format can be added to display as points in the map. Spreadsheets must be saved as .CSV files and clearly organized to allow for a successful upload. For more information on uploading map coordinates see Adding Coordinates from Spreadsheets to the Map. Several tools allow for identification and information of map features. Some feature results will display links to program web pages for additional details. A list of layers with matching results will display. Expand the layer and select the desired item to open the Description data frame with details about the selected feature. Links to more information may also be included in the Description. I see coordinate positions reported on the map system; can I use these with my GPS? The accuracy of these lat/long, UTM or WTM coordinates is unknown. While we have generally found it to be quite good, we do not consider it to be an appropriate tool incorporating them into a database. These coordinates are generated "on-the-fly" by the application. You must be aware of how your GPS collects, stores and displays data. I need to submit a map to the DNR Archaeologist/Cultural Resource Manager. What information do I need on the map? In order to create an accurate analysis for potential location of archaeological /historical sites, the DNR archaeologist will require adequate mapping information of the area of concern. 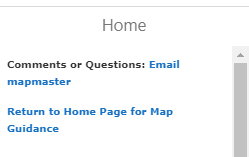 Directions for creating a map for submission a can be found at map creation for the Arch/Historical report maps [PDF]. Map themes are designed to display spatial information specific to an individual program/project. While certain layers may be "turned off" for a theme, layers can be manually "turned on" if so desired. Public Land (default): Displays a basic theme of DNR and other public lands. Also included are parking lots, boat access sites, public shooting ranges, leased hunting lands and trails. Land Sales: Displays DNR parcel that have been selected for sale to the public. Selection of the sale parcel will link to the DNR Real Estate Land sale pages for more information on the sale parcel. The State of Wisconsin has a variety of outstanding natural resources, such as rushing trout streams, quiet wetlands, pristine wild rivers, clear lakes, native prairies, vast green forests, Ice Age eskers and picturesque waterfalls. Wisconsin's increasing population, together with out-of-state visitors, is placing increased pressure and demands on these resources. Each year, thousands of people boat, camp, fish, hunt, hike, bike, ski, canoe, sightsee, study nature and pursue other outdoor activities. Our public lands are places where we can get away from daily routines and enjoy the natural beauty Wisconsin has to offer. Over the years, Wisconsin citizens have recognized the need to protect Wisconsin's natural resources and have provided the DNR with the ability and funding to purchase land. DNR's first purchase was made in 1876 and, since then, the DNR's land acquisition program has become an important tool to protect natural resources and provide outdoor recreational opportunities for the public. The DNR purchases land to manage and protect natural resources and to provide recreational opportunities to all the people of the state. Through the land acquisition program, wetlands, forests, scenic areas, prairies, savannas, wildlife and fish habitat, rare species habitat, glacial features and other resources are being protected and managed. The Department of Natural Resource manages lands through ownership, easement or lease rights. The map data should not be interpreted as representing legal property boundaries. State lands depicted are generally open to the public. Public use restrictions may apply due to public safety, or to protect endangered or threatened species or unique natural features. Lands may be temporarily closed due to specific management activities. Contact DNR customer service for more information. Neither the State of Wisconsin, the Department of Natural Resources, nor any of its employees shall be held liable for any improper or incorrect use of the information described and/or contained herein and they assume no responsibility for anyone's use of the information.